National Conference senior leader Dr Mehboob Beigh Wednesday filed his nomination papers from Anantanag parliamentary constituency for the upcoming Lok Sabha polls. He submitted his papers to the returning officer at DC office Anantanag where the opposition PDP has fielded party president Mehbooba Mufti against him. Mehboob Beigh was flanked by the National Confernce patron Dr Farooq Abdullha, State Congress president Prof Saif-u-Din Soz, Tourism Minister Ghulam Ahmed Mir and others. The constituency will go the polls on April 24 in the third phase of the elections in Jammu and Kashmir.Talking to reporters on this occasion NC patron Dr Farooq Abdullah told reporters that Modi wave can prove fatal for Muslims in general and Kashmiri’s in particular. 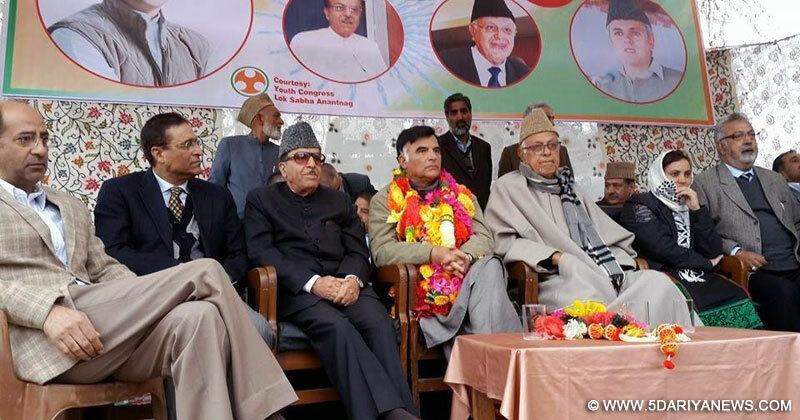 He said that there is no Modi wave the BJP and its supporting parties will taste defeat in the coming general elections.Responding to a query, Farooq Abdullah said that Muhammad Yousuf Bhat of Ganderbal is at liberty and he can talk anything against the party. “We are not scared of him and he can say whatever he wants to say,” he said adding that NC has not done anything wrong and there is no need to feel scary of Yousuf Bhat. State Congress president Prof Saif-u-Din Soz said that NC-Cong coalition is intact and there are no differences of opinions amoung the leaders of the both parties.